Dubrovnik is a city in Croatia. Dobrovnik is a village in Slovenia. Both have their attractions but Dobrovnik is really special. Magical even. I don’t think I’ll ever grow up. Not really. I might get a little more responsible, a little more sensible, a little more pragmatic, but at heart, I’ll still be that gullible kid who believes in magic, in fairies, in ghosts. I needed very little persuading when the lovely GZs suggested a trip across the border into Slovenia to Bukovniško lake and its magic forest that sit outside the village of Dobrovnik. Not too clear about what to expect herself, she sold me on the idea of healing energy and curing waters. Back in 2001, Dr Ilija Čosić (who, as far as I can tell, is a writer/professor from Novi Sad in Serbia) visited the lake and mapped the bioenergy and radiesthesy. [I had to check that one out: Radiesthesia is the science of using the vibrational fields of the human body to access information about other objects of animate or inanimate nature by establishing resonance with their energy fields, using specially calibrated instruments and a scale of qualitative measurement to decode this information.] He and his team of experts found more than 50 energy points clustered around two power lines that cross right where the church of St Vida (St Vitus) sits in the middle of the forest in Slovenia. The church of St Vida, at the centre of the energy lines, is like something out of a fairy tale. Back in WWII, there was a wooden structure on the site. During a battle not far from the chapel, one partisan managed to escape (they were hiding out in a local hunting lodge). Badly wounded, he crawled to his sanctuary. It was open then (unlike today). He didn’t expect to make it through the night but when he woke the next morning, all was well. Legend has it that he came back after the war and built the structure we see today. The lake itself is man made, and is about 2 metres deep. There’s a trail around it and a couple of picnic spots, too. It’s stocked with fish and fishing licences are available for purchase. As with anything good these days, there’s a caveat. 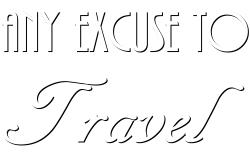 A sort of disclaimer that says that one visit won’t do it. You need to come back a number of times within a short period. Not that I need much of an excuse to visit Slovenia. This weekend marks the beginning of a long-promised break, a chilling out period, time spent reflecting, reading, and writing. And if I can fit in a couple of more trips across the border to Slovenia – I’ll be even more grateful for the joys of village life and the access to other worlds that living so remotely affords. https://i2.wp.com/anyexcusetotravel.com/wp-content/uploads/2009/06/AEL.jpg?fit=1944%2C2592&ssl=1 2592 1944 Mary Murphy https://anyexcusetotravel.com/wp-content/uploads/2018/09/long-aett640.png Mary Murphy2009-06-15 21:56:082017-11-10 19:42:42Kdo? Kaj? Kje? Kda?